If you take away the games he missed through suspension and illness he has featured in all but one of the 92 league games in the past two years and even then he was sat on the subs bench. Since he won back his starting place for the 3-2 win at Deepdale back in December he has been on the pitch throughout the ninety minutes of every remaining game apart from the second half at Grimsby when he was substituted following discussions in the dressing room. 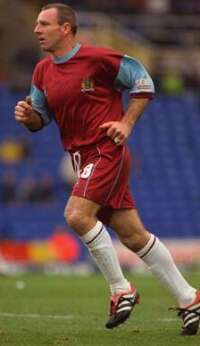 He joined us from Fulham on a free transfer just as the Isle of Man tournament got underway in 2000 and in fact made his debut in the embarrassing defeat against the island team. A southerner signed from Fulham but many seemed surprised when Bally spoke to hear the southern accent, so much is he associated with the North East. That's no surprise, he was a Sunderland player for over a decade and played not far short of 400 games for them. Not only that he was a cult figure there and at the time we signed him were told by some Sunderland fans that we only had him on a temporary basis. 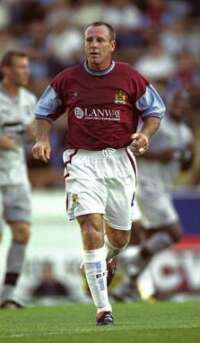 He made his Turf Moor debut in a pre-season friendly against of all clubs Newcastle United and received a less than friendly welcome from the visiting fans and then his league debut for the Clarets was at Bolton as we made our return to the First Division. Bally was used to the big passionate crowds but he looked stunned as he saw the mass of Burnley fans at the Reebok as the team came out. 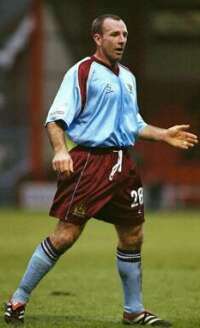 It took a while for some Burnley fans to take to him but his style eventually won most supporters over. It was suggested that Bally got on with his work at times almost unnoticed but it would become obvious when he was out of the side. That was certainly the case in early 2001 when illness kept him out of the side for a while. Had anyone suggested that a Burnley player would be sent off twice last season then I'm sure most would have put his name forward. The first was perhaps fair enough but the second at Bramall Lane was a joke, a joke that cost him the start of this season. After discussions during last summer he looked all set to become the first Burnley player to be interviewed by Clarets Mad but the High and Mighty Burnley Football Club put a block on it, a decision that stunned Bally as much as ourselves. That second sending off cost him a place at the start of the season but he was straight back in after missing the first two games. He was suspended again in November and apart from the one match ban he was left on the subs bench for a handful of games. In one of them he came on at Coventry and played the entire second half in the centre of defence. He was to play there again on a few occasions later in the season and was outstanding every time. Having won his place back for the game at Deepdale, did you all see Mark Rankine running away, and he was never to be left out again. He turned in some superb peformances in the second half of the season as we faltered and none more so than the away games at Watford, Barnsley and Sheffield United. At Bramall Lane in particular as we completely crumbled Bally was like a rock at the back and what the score might have been without him was a frightening thought. It is fair to say he was not the best finisher in the world, but he was definitely the scorer of our first goal in the win against Gillingham recently as Ian Moore's touch was taking the ball away from goal. Somehow thought he was the midfielder always getting into the box and on the end of everything when you would have expected him to be the least likely. Some of our other midfielders could and should have been learning from him. He's gone now after two years and it has been two years where he has given everything for the Claret and Blue cause. We were told by Sunderland fans what we would get from him and make no mistake he hasn't let us down. I for one am sad and disappointed to see him go, I think he will take some replacing and I'm not so sure where that replacement will come from and how much he will cost. The hard man on the pitch is just the opposite off and is a great bloke. It is not that long ago that he was commended for his work with the community programme and that will surprise nobody who knows him.